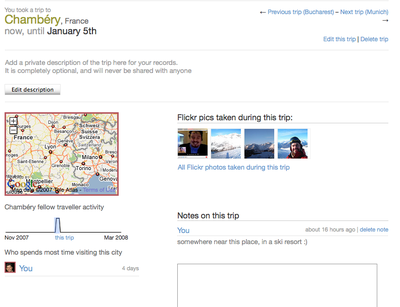 I added a destination last night on Dopplr (too bad you can't add something that started earlier than today). And immediately, Dopplr fetched my pictures of this place from my account on Flickr. Waow, this is a great integration, transparent, useful. I've added a new category to this blog (it's really been a while): discussing a feature I like on an online service, or a feature that is missing on a service. What do you think : useful ?